On Wednesday last week, one of the most interesting developments in the local political sphere in recent memory emerged. It happened when the news broke that a new political party had been formed and registered with the Office of the Electoral Commissioner. In a one-party state where the Human Rights Protection Party (H.R.P.P.) has become the absolute holder and controller of all political power, the idea that another political party has arrived on the scene is exciting to say the least. It’s a breath of fresh air to be honest. It’s too early to say whether they have the potential to do well. It’s also way too early to even make comparisons with some of the parties that have dared ventured against the H.R.P.P. in the past. Keep in mind that when the story broke on Wednesday, there wasn’t a lot of information about the group. All we were told was that the name of the group is the Samoa First Political Party (S.F.P.P.). Then we were told by the Electoral Commissioner, Faimalo Matthew Lemisio, that the Party’s Secretary is Feagaima’alii Bruce To’omalatai. He wasn’t immediately available to talk to us then. But another party member and prominent lawyer, Unasa Iuni Sapolu, left us in no doubt that these guys mean business. “This is a new political party that has been formed, prompted by our beloved people in the villages as they become informed of the law and their rights, they force the move which is now the new party,” she wrote in an email to the Samoa Observer. On the issue of bribery, corruption and election fraud, it’s hard to disagree with Unasa. It has been the downfall of the election system in Samoa since the start and despite the Government’s best efforts to try and address the issue; it doesn’t look like much has changed. But then that’s politics for you, isn’t it? Whether it’s Samoa or anywhere else in the world, corruption and bribery are part and parcel of any election. Still it’s good to pray and hope that one day, yes one fine day, we might be able to move away from it and have a truly free and fair election. Now on page 2 of the newspaper you are reading today, S.F.P.P.’s Secretary Feagaima’ali’i opens up about the motives behind the establishment of the party and what they hope to achieve as the country gears up for the 2021 General Election. We encourage you to read and be informed. In the meantime, the arrival of the new party is obviously not lost on Prime Minister Tuilaepa Dr. Sa’ilele Malielegaoi, the man who has been proudly lording over the H.R.P.P. for close to 20 years since he became their Party Leader. Well he’s right and we couldn’t agree more. But Tuilaepa had a bone to pick with the new party. “So why have they called themselves Samoa First? Are they the first party (in Samoa)?” he asked. 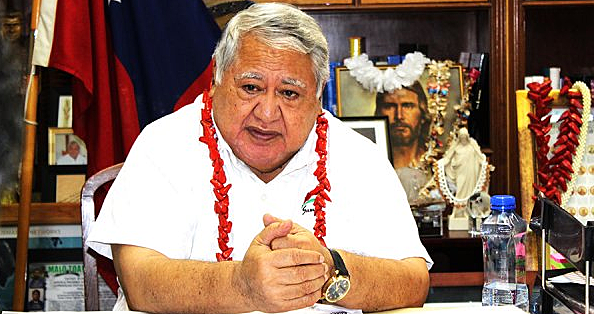 Tuilaepa added that it is misleading to use the words “Samoa First” in the name. Classic Tuilaepa politics, isn’t it? In Samoa today, it’s undeniable that Prime Minister Tuilaepa is a very powerful man. In fact, he is undoubtedly the most powerful man in this country presiding over a party that has the ability to make any changes they want wherever, however and whenever. That party by the way dominates Parliament. Of 50 Members of Parliament, 47 of them are under Tuilaepa’s absolute control. It is obvious politics in Samoa needs a breath of fresh air and some new faces and the arrival of Samoa First Political Party is a good start. Let’s hope there are more parties in the pipeline who will find the courage and conviction to stand up for the sake of a proper democracy and functioning Parliamentary system.